Today is the unofficial start of summer and this means it’s time for beach wedding season! 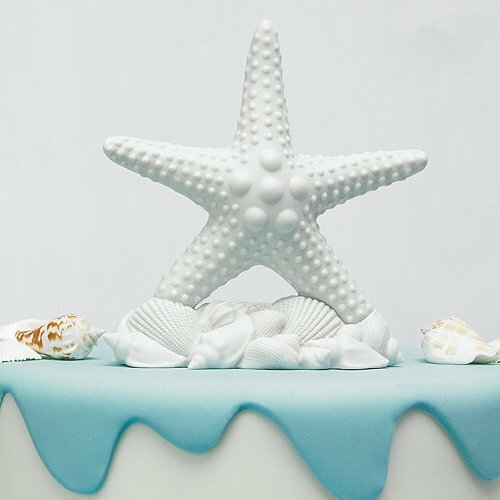 And what better way to celebrate your beach-themed (or beach location) nuptials than with this fun and whimsical starfish wedding cake topper. Sure you could put a standard, boring cake topper on your wedding cake – or you could forgo the cake topper completely – but why would you when something this fun exists? The starfish cake topper is all white and features smaller shells on the base, so it would look amazing on just about any cake. But if you had a cake that featured some ocean-inspired colors, it would be stunning! You can find this fun starfish cake topper here.